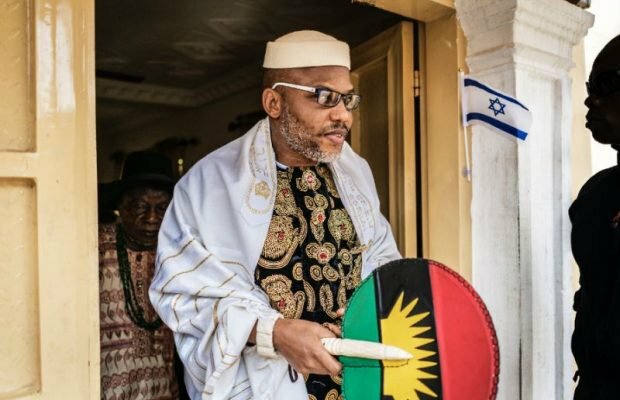 Nnamdi Kanu, leader of the Indigenous People of Biafra, IPOB, has failed to appear in court as his fellow defendants are now in the Federal High Court Abuja for continuation of their trial. Others standing trial alongside the IPOB leader before the Justice Binta Nyako-led Federal High Court include, Chidiebere Onwudiwe; an IPOB member, Benjamin Madubugwu and David Nwawuisi. Kanu, alongside the three defendants are facing charges bordering on treasonable felony. The three defendants were brought to court by prison officials at about 10am, as the court commenced today’s hearing. Also in court is Kanu’s counsel, Ifeanyi Ejiofor, who is insisting that the Federal Government is still holding his client in custody. Recall that the Department of States Services, DSS, had earlier barred journalists from covering the trial, but were later let in.